Drawing is the foundation of all genres of art related to form. If there is inaccuracy in oil painting or other media in form, it’s usually a drawing issue. 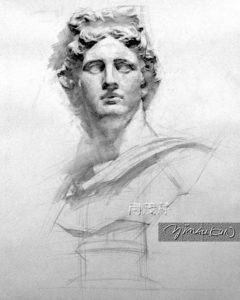 Classical bust study is the foundation of drawing. 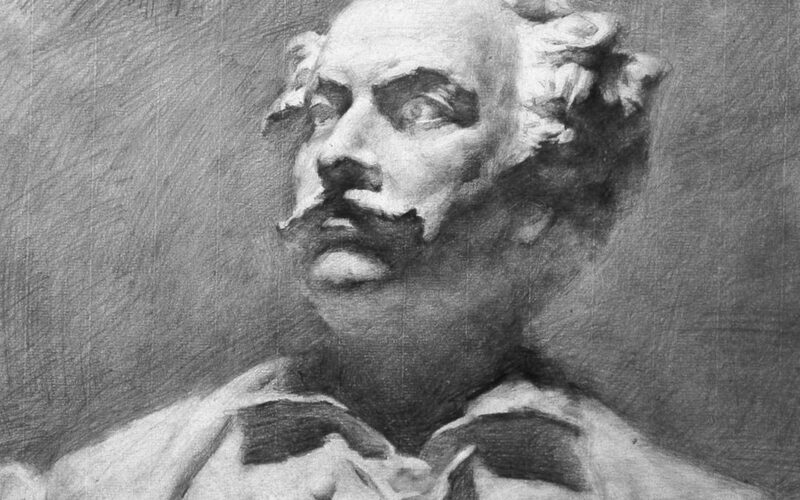 Just how important is classical bust study in drawing? My formal art education comprises of four years (1959-1963) in the Affiliated High School of Guangzhou Fine Arts Academy and two years in the Theater Design program in Guangzhou Fine Arts Academy. During those four years in high school, there were two weeks of water color and two weeks of oil painting. The rest of the art curriculum was dedicated to drawing. 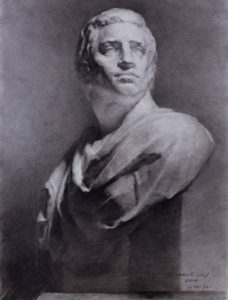 About 70-80% of the drawing curriculum was classical bust study. At the beginning, there were basic shapes and still life drawing. Towards the end of the four years, there was life portrait drawing. I counted 4-5 life portrait drawings during my time in high school. So it suffices to say that most of the formal art training I ever received is classical bust study. Classical bust drawing assignments fall into three categories: short term assignments take 11-12 hours; medium term assignments take 19-20 hours; long term assignments are 30+ hours. The longest term assignment that I have ever done is a drawing that took 48 hours. 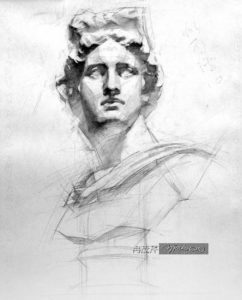 In spite of limited training in other media such as oil painting, water color and pastel, I was able to leverage on my solid training in drawing and classical bust study to self educate and build a painting career. 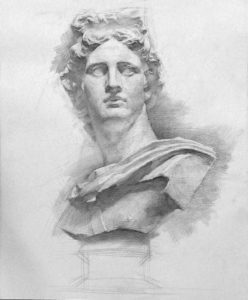 Why is classical bust study an important part of art training? Classical bust study is a good way to train your observation skills which can then be broadly applied to all forms of art. In drawing and painting, we need to observe the subject as a whole to analyze its proportion and perspective, value relationship, structure, etc. during block-in. For beginning artists, it’s quite natural that they are often attracted to details or specific parts of a subject and forget about the “forest.” Classical bust’s form is much simpler than a real human being’s and therefore helps the artist focus on observing the subject as a whole. Since there is no color in a classical bust, the artist can solely focus on the study of value, analyze the value relationship of different color blocks, identify the lightest part and the darkest part of the cast and further analyze the value in each color block. Planar analysis is key to rendering volume on two dimensional media. However, dissecting a subject into blocks, planes and smaller planes doesn’t come naturally, it’s in fact, counter-intuitive. Classical bust’s clear structure and lack of color help us observe the structure, volume and planes and render volume with value and lines. Lastly, unlike human models who may get tired from long time sitting, classical busts will never complain about for however long they have been sitting there. We can take as much time as we need for in-depth study of form, value and structure. Did I say that I once spent 48 hours on a classical bust study? This drawing is a teaching demonstration. It’s a good example of how I seek to build not only the shape but also volume during the block-in stage. 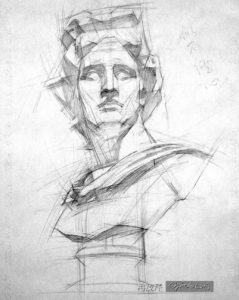 Construct the classical bust on paper using straight lines and conduct planar analysis. Hatch the dark areas using gray. Using gray for dark areas at this point facilitates revisions we can reinforce or eliminate any parts later easily. Based on the dividing line of the dark and light, reinforce the dark areas and the light areas. Create details by creating different levels of value. Create another three layers of value in dark, middle and light values respectively. In other words, in the dark value, you need to see and create dark, middle and light value within the dark value. The same goes for the middle and light values. At this point, the drawing is almost done. Finish the base of the bust and add the backdrop. When it comes to the backdrop, it may or may not fill the paper. If the backdrop fills the paper, it create a sense of space. If it doesn’t fill the paper, it creates a sense of rhythm.